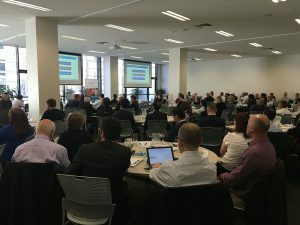 Ansvar Insurance, one of Australia’s leading specialist insurers has recently concluded its most successful series of education forums to date, setting a record attendance of more than 300 delegates across Australia. The latest series of forums, titled Innovation Revolution: The New Age of Insurance, provided brokers detailed insight into the changing landscape of the Insurance industry from an innovative technology perspective. This included Ansvar’s progressive adoption of the latest technology for risk assessment and mitigation with the use of drones, thermography and security and fire detection systems. Ansvar launched their new Business Resilience Toolkit at the forums to help brokers assist their SME clients in the event of a crisis. This new risk solution product follows the release of Ansvar’s new business insurance products for SMEs in July 2016. The Business Resilience framework consists of three components; a Crisis Management Plan, a Business Continuity Plan and Recovery Plans, all of which equip brokers to seamlessly work with their SME clients in the face of a disruptive event. “The record attendance is a clear sign that brokers value these forums, as they provide insight into current issues and emerging trends within our specialty industry sectors. They are the perfect opportunity to share with brokers the latest risk and insurance solutions needed to best service their clients across all of the sectors in which we operate,” said Warren Hutcheon, CEO Ansvar Insurance. Ansvar’s next series of Broker Forums are currently being developed for August 2017.